The Griffin™ 460 GC/MS from FLIR enables multi-modal sample introduction to detect and identify complex chemical samples. 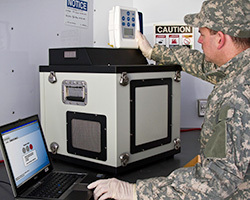 With unparalleled selectivity for informed decision-making, the Griffin 460 is able to accept liquid, solid, and vapor samples as well as provide continuous direct air monitoring. The Griffin 460 is the only mobile GC/MS to provide this range of sample introduction in a single system that also enables MS/MS analysis. Note: FLIR Griffin 460 is the successor to ICx Griffin 450. Learn more about our Maintenance Management for the FLIR Griffin 460 GC/MS and all of your analytical instruments. KD Analytical Maintenance Management is a suite of services that can save you money and time while helping to guarantee the readiness of your FLIR Griffin 460 and all of your analytical instruments. ReadiTrak web-based asset readiness manager tracks instrument status, preventative maintenance, repair history, and maintenance costs of your Griffin GC/MS instruments and virtually any other gear your count on to do your job. One-call, 24x7x365 reachback support for Griffin GC/MS and all of your instruments, regardless of manufacturer. Our analytical instrument experts help you complete most maintenance and repairs over the phone, saving you money. Expert repair for your Griffin GC/MS provided by our support center. And, we manage OEM/warranty repairs when needed, eliminating headaches and reducing downtime for your team.